I can't find how to do some things I used to do before I upgraded. Right now I want to put 3 seconds of silence between tracks on an audio CD, but I can find no setting that allows me to do hat in Creator NXT Pro 3. Any help? Uhhhhh, what program, in the suite of programs, are you using? Although the Roxio suites out now can do what you want, Easy Media Creator 7 and 7.5 were the best at doing that. I'm using Roxio Creator NXT Pro 3 version 16.0.50.2. I went into Music Audio. Go to Create Music Projects. 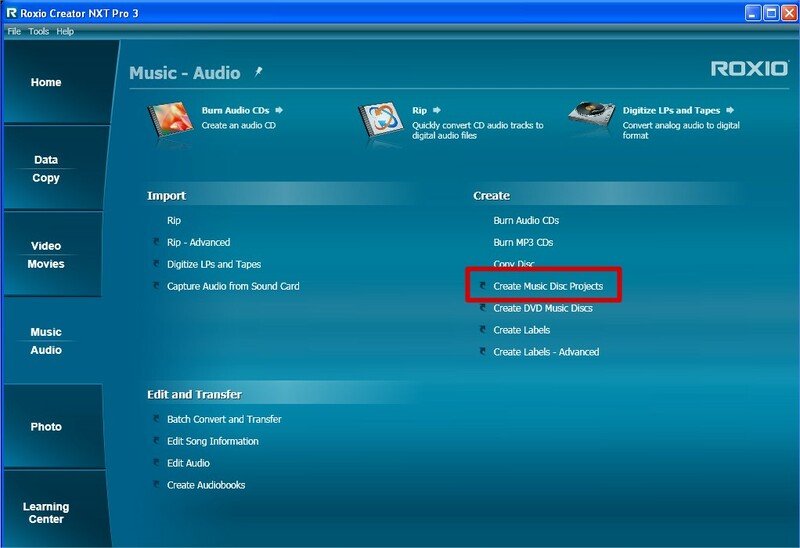 In Roxio Music Disc Creator make yourself a project for an audio CD. Then set the Transitions on each track to 3.0 seconds. Than should do it for you. That looks like what I was searching for, but couldn't find. The help files were of zero help. As soon as I have time, I'll try that. Thanks, Brendon. I have been down at the lake, sitting around a campfire, since I posted. I came back up to the house about 25 minutes ago and saw his response, and your solution to the problem, after Don posted the needed info. A day late, and a dollar short for me, giving him an answer after the information needed, was posted. Sounds fun Bruce. Keep it up.